4 Bedroom Detached Cottage For Sale in Bedford for Guide Price £695,000. This property's price has dropped from £725,000 to Guide Price £695,000. Waterfall Cottage is an impressive rural property with over 3.5 acres of land. 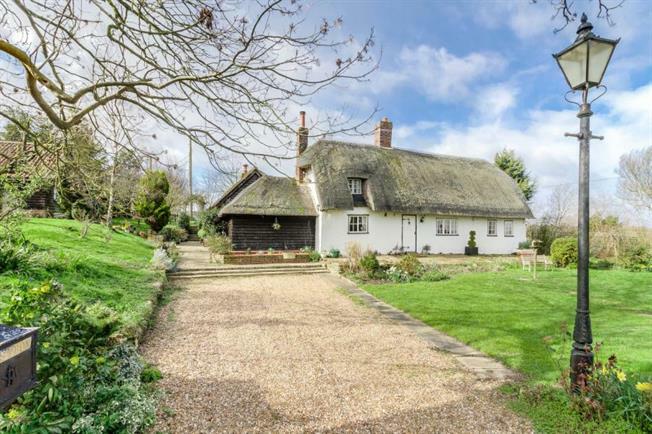 This picturesque Detached Thatched Grade II listed Cottage is located four miles outside of the town of Bedford. The original and main part of the cottage was constructed in 1650, since this time the property has been greatly improved and significantly extended. With a vintage feel kitchen/breakfast room with hand built Oak units and a Rayburn cooking range, supplying , oil fired central heating and cooking. There is also a separate electric hob and combination oven. and Mega flow hot water system. The family /living room houses a unique Inglenook fireplace with log burner. A separate dining room also houses a log burner. The ground floor bathroom with freestanding vintage roll top bath, plus shower cubicle, wash hand basin and separate WC. The ground floor has added accommodation with a guest bedroom at the far end of the cottage, containing an en suite shower room. The first floor very much reflects the character to the property. The master bedroom is set in the middle of the property with the second bedroom at the rear, this is currently used as an office and could be easily adapted to a nursery or even an en-suite. At the opposite end of the house is another double bedroom with superb views. The property offers a beautiful private surrounding of three and a half acres, there is a lawned area to the front of the property with off road parking for several vehicles as well as a second driveway which leads to the double garage and workshop. To the right hand side of the property sits the orchard area with its own gated access point, offering many fruit trees including apples, pears, cherries and plum. To the rear of the property there is a pond and chicken run area with access to the two paddocks with stables, past this is an additional strip of scrubland. Within the immediate parts of the garden from the house there is a secluded patio with a more intimate laid to lawn garden and summer house area. Located on the edge of Thurleigh, there are amenities close which include a farm shop and cafe/restaurant. It also offers a wide variety of social, sporting and community based organisations. This is the perfect location for any countryside enthusiasts, offering many options for county walks and the opportunity to be part of a friendly village community. With Bedford town centre just some five miles away you are still near to a wide range of shops, restaurants , bars and Bedford station with regular trains into London . Thurleigh has its own infant/junior school and is within the Sharnbrook school catchment area.